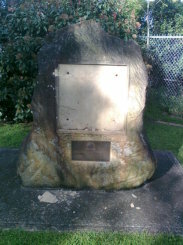 THIEVES have stolen a bronze plaque in Beecroft which commemorated the end of World War II in the Pacific. "It looks like a crowbar was used to rip the plaque off the memorial," Cr Berman said. Beecroft is rapidly being Asianised, but I'm sure that has nothing to do with it. This sort of crime happens always and everywhere, doesn't it? File under: memorial of decline.